Boeing has worked with the Federal Aviation Administration (FAA) since U.S. President Calvin Coolidge signed the Air Commerce Act of 1926 authorizing the U.S. government to establish airways and navigation standards, issue airworthiness certificates, license pilots and investigate aircraft incidents. The Boeing-FAA relationship is built on respect, trust and a common purpose: ensuring the safety and efficiency of the global air transportation system, and most important, the safety of the people who depend on it. At a high level, the certification process is a series of steps that generally include: planning how to meet federal requirements; gathering non-flight test compliance data showing compliance; flight testing to show compliance; and finally, closure. At closure, the FAA reviews program and certification documents to assess whether the company satisfied regulatory and compliance requirements. Setting certification requirements begins with what is called the “certification basis,” a document Boeing submits that proposes the criteria for its new airplane design. After FAA review and approval, these criteria are incorporated into Boeing’s certification plan, which is designed to demonstrate compliance with all regulatory requirements. Where existing regulations are ill-suited to address novel or unusual design features, the FAA develops and applies new requirements called “special conditions.” These special conditions ensure that new design features are fully addressed in the certification process. Aviation safety is a shared responsibility – and while the FAA is the primary regulator of aviation safety in the U.S. – it, Boeing and the aircraft operators have distinct roles. The FAA establishes design, manufacturing, and operations regulations and issues findings indicating whether parties are in compliance. Boeing, as the airplane manufacturer, “owns” airplane designs; demonstrates compliance with FAA regulations; and proves its facilities, manufacturing and quality processes can replicate production reliably. Operators – usually an airline – must operate and maintain their fleets. Boeing works with the FAA throughout the certification process. On certain activities, the FAA has granted Boeing organization designation authority (ODA) to act on behalf of the FAA. This delegation is authorized by Congress, and has roots that stem back several decades. The FAA oversees ODA, and the FAA’s delegation of authority allows the agency to prioritize its review of issues and to ensure that its own expert personnel are devoted to the highest-value activities. Decades of experience have shown that delegation is an effective and essential way to ensure aviation safety. The delegation system permits the FAA to focus on its critical priorities—safety, rulemaking, and certification—while delegating routine compliance activity to manufacturers, subject always to strict oversight by the FAA. The 787 Dreamliner represents the most exhaustive certification effort ever undertaken at Boeing, not surprising given the range of new technologies, systems and materials embedded in its design. At the conclusion of the certification process, the FAA reported that its staff logged 200,000 hours of technical work on the 787 type certification. Boeing employees exceeded that mark while showing compliance with more than 1,500 airworthiness regulations and presenting 4,000 documents comprising test plans, flight test reports and safety analyses. 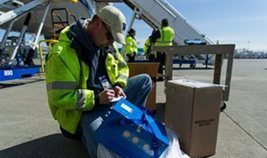 Boeing employees also demonstrated compliance with over 16,000 federal requirements relating to inspection, test parts and setup. Boeing received FAA type certification for the Dreamliner in August 2011. The eight-year certification process for the 787 was the most rigorous in Boeing’s history, and the design of the 787 incorporates nearly a century of aviation learning and safety improvements. When the 787 returns to service, passengers should know that it is safe, that it is technologically the most advanced airplane in history, and that they are experiencing an airplane that is a milestone in the history of the safest mode of transportation in the world.